When’s Melee is a weekendly preview of SSBM tourney streams. 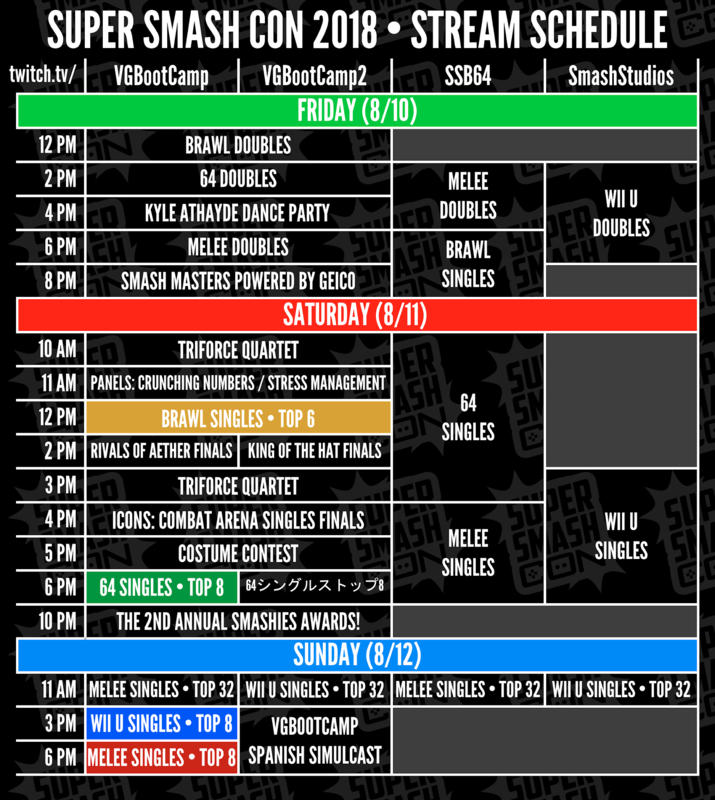 If you know of any streamed events not on here (excluding weeklies), please give me the relevant info on Twitter or here in the comments. Featuring: Hungrybox, Armada, Mew2King, Flipsy, aMSa, Zain, Jerry, Lucky, Swedish Delight, ARMY, PewPewU, Westballz, AbsentPage, KJH, La Luna, Captain Smuckers, iBDW, MikeHaze, Rishi, Ice, Ginger, Junebug, ChuDat, Bladewise, Amsah, 2saint, Gahtzu, Drephen, Nintendude, Overtriforce, Spark, dizzkidboogie, King Momo, Darktooth, Android, MacD, $mike, Zamu, DaShizWiz, Hax, Uncle mojo, Kalvar, MilkMan, Redd, Sharkz, Reeve, and a lot more good players from all over. Featuring: Trif, Nicki, Däumling, SchlimmShady, Usleon, Fatman.spam, Kellner, Sneddy. Featuring: Iceman, Bizz, Chief, Chevy, Chango, Pocket Sand, Dacky, Spoon, Ganobrator. Sam “Julius Pringles” Greene can be found on Twitter @SSBMDingus. If you’re about to comment on Reddit about a tourney that isn’t on here, please mention its stream when you do so.